Best Hotel Chain Iberostar Resorts received the Crystal Award for "Best Hotel Chain" from Apple Vacations. Iberostar Tucan and Iberostar Quetzal Highly recognized by ecstatic vacationers as one of the best All-Inclusive Resort Chains - Iberostar Tucan & Iberostar Quetzal have it all! Surrounded by spacious, tropical gardens, this complex blends harmoniously into the landscape. The complex consists of the All Inclusive Hotel Iberostar Tucan (350 rooms) and the All Inclusive Hotel Iberostar Quetzal (350 rooms) in three-story buildings. 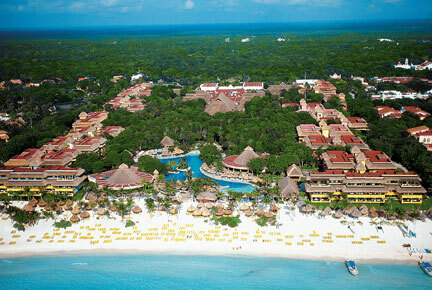 Iberostar offers great service and great all inclusive family vacation experience. 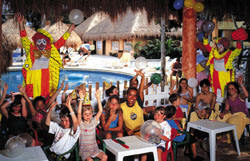 Past vacationers have rated Iberostar as "Excellent" on food and beverage and dining services. In fact, feedback on all aspects of this resort rank Iberostar as most outstanding All-Inclusive and worthy of the Crystal Award Best All-Inclusive Chain for 3 consecutive years. Tastefully fitted rooms with 1 king size bed or 2 double beds, bed-settee, shower, WC, air conditioning, ceiling fan, hairdryer, telephone, satellite TV, minibar, safety deposit box, balcony or terrace. Junior Suite - With garden or pool view. King bed only-A/C, balcony or terrace, ceiling fan, hair dryer, mini-bar, safe, phone, cable TV, iron/ironing boards. Standard - A deluxe room with a garden or pool view,A/C, balcony or terrace, ceiling fan, hair dryer, mini-bar, safe, phone, cable TV, iron/ironing boards. Surrounded by spacious, tropical gardens, this complex blends harmoniously into the landscape. The complex consists of the Hotel Iberostar Tucan (350 rooms) and the Hotel Iberostar Quetzal (350 rooms) in three-storey buildings. 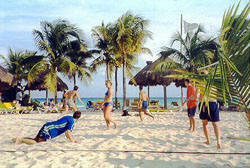 There is a reception, lobb y with bar, lounge bar, main restaurant and several specialities’ restaurants. The complex has a large pool area with an activities pool, a lagoon, an adults’ pool with swimm-up-poolbar and separate children’s pool. Sun loungers, parasols and towel service on the beach and by the pool included. Beach Club with restaurant. Various shops. Discotheque and entertainment centre. Access to the Internet for an extra charge. Room service from 11:00 to 23:00 hrs. Daily Activities: Bike Tours, Olympic Games, Air Rifles, Archery, Volleyball, Dance Classes, Spanish Classes, Water Basketball, Waterpolo. Evening Activities: Nightly Entertainment with Live Band (Horror Show, Mexican Show, Las Vegas Movie), Theme Parties, Mascara Disco from 11 pm onward. There are three different clubs available for children between the ages of 5 and 16 from 10:15 am to 5:00 pm. The Mini-Club is for kids between 5 and 7, the Maxi-Club isfor 8 to 12, and the Teeny Club is for 13 to 16. Buffet for breakfast and lunch, evening meal buffet. Twice a week reservation in the à la carte restaurants guaranteed. For dinner please wear formal clothing (long trousers for gentlemen). Snacks, international and national alcoholic drinks round the clock. Beer, wine and soft drinks only at night from 3 a.m. to 9 a.m. Soft drinks, beer and water from the minibar. An a la carte Italian restaurant, reservations are required. There is an elegant dress code, gentlemen are requested to wear slacks (no jeans). Hours are 6:30 to 10:30 pm. An a la carte Mexican restaurant, reservations are required. There is an elegant dress code, gentlemen are requested to wear slacks (no jeans). Hours are 6:30 to 10:30 pm. An a la carte grill steakhouse, reservations are required. Gentlemen are requested to wear slacks or Bermuda shorts (no jeans). Hours are 6:30 to 6:30 to 10:30 pm. A beach/pool snack bar serving a continental breakfast from 10:00 am to 12:00 noon, a buffet lunch from 12:00 noon to 4:00 pm, coffee and cakes from 4:00 to 5:00 pm, and snacks until 6:00 pm. 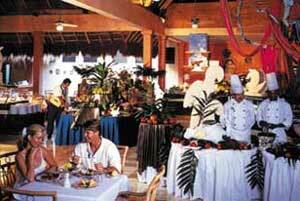 The main restaurant serves delicious buffet style meals, featuring show cooking and special theme nights. Breakfast is served from 7:00 to 10:00 am, dinner is served from 6:30 to 9:30 pm. No shorts or sleeveless t-shirtsare allowed during dinner. Please note: Men must wear dress shorts for buffet dinner and long pants for the a la carte restaurants. At check-in the hotel provides each room with a number of restaurant coupons that may be used based on the duration of the stay. One coupon is issued for 3-4 night stays, 2 coupons for 5-8 night stays and 3 coupons for 9-11 night stays or longer. The above limitations apply to dinner only and all passengers may dine at the buffet restaurant as many times as they wish. Stay At One, Play At All - Guests staying at the Iberostar Quetzal and/or Tucan can enjoy Dine Around options - Access to all bars and restaurants at both Iberostar Resorts.